This stylish hotel is perched on a quiet corner of the Cannaregio district, where the atmosphere of old Venice has been preserved, off the tourist track and full of old restaurants and taverns. Yet all the sights are within easy walking distance, provided the property lies only 5 minutes to the Rialto Bridge and 10 minutes to St Mark's Square. The establishment is an example of Venice's minor architecture, but preserves the fascination of the ancient city. The moment travellers enter via the distinctive courtyard, they will be received by romantic atmosphere of the Venice of times gone by. The rooms and suites are characterised by a wealth of detail, fin de siÃ¨cle period furniture, sumptuous tapestry and modern amenities. Guests may take advantage of the mouth-watering breakfast served at the enchanting dining room and after a busy day of meetings or sightseeing relax on the rooftop terrace offering quaint city views. 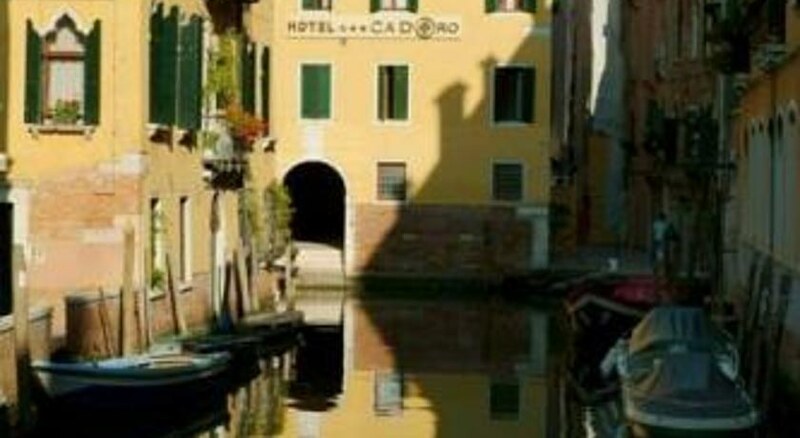 The hotel is situated on a quiet corner of the Cannaregio district- where the atmosphere of old Venice has been preserved- off the tourist track and full of old restaurants and taverns. Yet all the sights are within easy walking distance: it is just 5 minutes to the Rialto Bridge and 10 minutes to St Mark's Square.The hotel building is an example of Venice's minor architecture- but preserves the fascination of the ancient city. The moment guests enter via the distinctive courtyard- they will be engulfed in the intimate and very particular atmosphere of the Venice of times gone by. They will be carried back to the age of gondolas moving back and forth among the palaces- mysterious custodians of amorous intrigues and conspiracies. The original 13th century beams and marble features in the space used as the reception hall have been preserved in perfect condition through careful restoration- and the chandelier and splendid antique mirror are a testament to the sublime skill of the master glaziers of Murano. 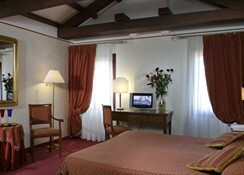 Renovated in 2006- it comprises 20 double rooms- 5 single rooms and 2 junior suites spread over 4 floors. 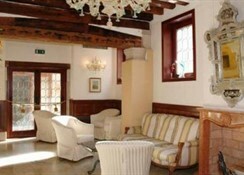 Facilities provided at this air-conditioned hotel include an entrance hall with 24-hour reception- a hotel safe- a currency exchange facility- lift access- a café- a bar- a TV lounge- a restaurant- Internet access/ WLAN access point and room service.The rooms are characterised by a wealth of detail- fin de siècle period furniture- sumptuous tapestry- Murano chandeliers and facilities including a satellite TV- a telephone with direct outside line- wall safe and independently-controlled heating and air conditioning- all served by a lift- making the rooms real little gems. 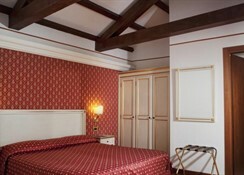 All rooms have mosaic-tiled bathrooms- embellished with Murano glass mirrors and lights and with either a bathtub or a shower cubicle and a hairdryer. 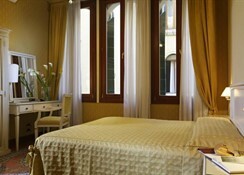 A double bed- a minibar and a terrace also come as standard.